Scorpion EXO-500 & EXO-1100 Graphical refresh: What is old is new again! Scorpion’s EXO-500 and mighty EXO-1100 are getting a fresh redesign for the spring of 2014 with the introduction of the Corsica, Jag, and down right Crude graphics. I am sure at this point you all know about the features the EXO-500 and EXO-1100 include so I will not bore you with the technicals. 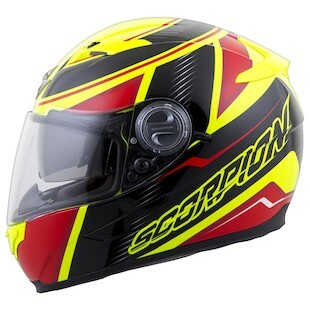 Scorpion’s entry level EXO-500 is their long time best selling full faced sport and touring helmet with two new graphics in a multitude of different colorways. 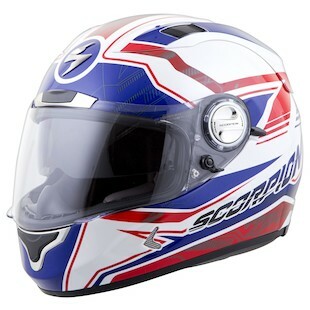 The Scorpion EXO-500 Corsica style helmet, available in Blue, Phantom Grey, Red, and a neon Red/Yellow combo has a sharp, aggressive look to it with just enough pizzazz to set you apart from the rest. Subtle detailing within the graphic gives this version of the EXO-500 a high quality look which you would not typically find in an entry level helmet. Last up is a sharp design for the pinnacle EXO-1100. 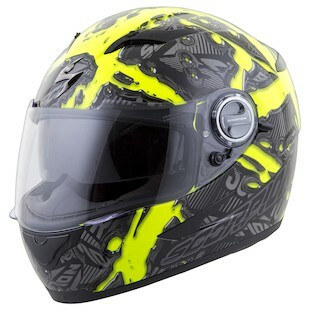 The Jag, made in four colorways, combines a multitude of shapes and designs to give this helmet a sleek race-inspired look. For the Jag Helmet, you will have from a Phantom Black, Hi-Viz Yellow, Red and White, and Patriotic Red, White, and Blue colorway to choose from. Personally, the RWB combo looks great on the Scorpion EXO-1000 Jag, adding some well needed spice to the full face drop down sun visor helmet lineup. My grandfather always told me, “If it ain’t broke, don’t fix it.” It seems like Scorpion is sticking with that philosophy, too with the revitalization of two of their most prominent full faced helmets.